A social network is a web of relationships formed by individuals connected to one another by and through social ties. It is difficult to overstate the importance of social networks to human societies. If you define a “society” as existing by virtue of interactions among humans (following Jonathan Turner), you recognize that the social networks which both mediate and are formed by those interactions constitute the basis of human sociality and form the “backbone” of social structure. The importance of social networks to all human societies makes them a fundamental and enduring topic of anthropological, archaeological, and sociological interest. If you don't believe me, ask A. R. Radcliffe-Brown, John Barnes, Fredrik Barth, Georg Simmel, Siegfried Nadel, and Alexandra Maryanski. The social networks of hunter-gatherers are of special interest because of the vital role that these networks play in hunter-gatherer systems and the importance of these systems to so many questions of human prehistory: the emergence of language and culture, patterns of gene flow related to the evolution of modern human anatomy, the invention and development of technology, the dispersion of our species from Africa, and the colonization of the New World all occurred while the world was populated by hunter-gatherers. Hunter-gatherer societies formed the foundation from which the institutional and organizational features of “complex” societies (i.e, chiefdoms, states, empires) ultimately developed. This makes understanding the characteristics of the networks of “simple” hunter-gatherers of primary importance. Much of the discussion that follows is modified from content in Chapter 2 of my dissertation (White 2012; pdf available here). It is very much condensed. Please consult the complete document for further information and if you wish to cite anything I've said here. References for citations are provided in the Bibliography section. The term "social network" is used to refer to both the personal social networks of individuals (i.e., an assemblage of individuals with whom a particular individual has social relationships) and larger system-level social networks that is formed from the inter-linking of many personal networks. This inter-linking of personal networks “transforms an aggregate of individuals into a group” (Blau and Scott 1962:3), binding individuals into larger cultural systems and channeling information, people, genes, and resources. In most cases when I use the term "social network" I am referring to these larger system-level networks. By definition (the definition I use, anyway), each individual in a social network can be connected to every other individual through a path that utilizes one or more social ties. If two individuals cannot be connected, they are not in the same social network. Thus the extent of a social system can be defined by the extent of the social network that connects the individuals within it. Path length (discussed further below) is a measurement of how many social links are required to get from one person to another. System-level social networks are emergent phenomena: they are the result of persistent regularities or patterns of social interactions among individuals and/or groups of individuals. There are both "bottom up" and "top down" effects: the social behaviors of individuals both produce a system-level social structure and are influenced by it (Barnes 1972; Blau and Scott 1962; Radcliffe-Brown 1940). As emergent phenomena that exist at a level above personal social networks, system-level social networks have a structure with properties and characteristics that can be identified, described, analyzed, and classified (Turner and Maryanski 1991; Maryanski 1996:69; Nadel 1957; Wasserman and Faust 1994:6-7). Because structure is the pattern of inter-relationships, the structural characteristics of a network can be considered without knowing the details of each constituent relationship. many social relationships are defined, formed, and/or maintained by symbolic, culturally-defined behaviors (e.g., kinship and exchange). Nested structure. The personal social networks of individual humans are multi-level entities with nested groupings of increasing size: an “ideal” personal social network can be represented graphically as a series of concentric circles of acquaintances with ego at the center (illustration to the right). Each successive circle defines a larger, more emotionally distant level (see Boissevain 1974:46-47; Gamble 1998, 1999; Hill and Dunbar 2003; Stiller and Dunbar 2007; Zhou et al. 2005). The innermost circles of a person's social network (i.e., the intimate and effective networks) are composed of a small number of individuals with whom ego has close relationships maintained with frequent contact. These circles are likely to contain family members and close friends and be characterized by a high density of social ties (i.e., everyone knows everyone else). The extended network is composed of a wider circle of acquaintances, friends, and relatives with whom ego has less frequent contact. Personal network size. There is great variability in the size of the personal networks of individual humans (e.g., see Bickart et al. 2010; Hill and Dunbar 2003; Killworth et al. 1990; McCarty et al. 2001; Roberts et al. 2009; Stiller and Dunbar 2007). Many studies find the mean size of extended networks (the largest component of a person's social network) to be between about 100 and 300 (see Boissevain 1974:117; Hill and Dunbar 2003; McCarty et al. 2001; Roberts et al. 2009; Stiller and Dunbar 2007). Dunbar (2003) suggests that the size of the active network a person can manage may be constrained by cognitive physiology, as a number around 150 is predicted from the size of the human neocortex based on the relationship between neocortex and group size seen in other primates (see also Bickart et al. 2010). Cultural mechanisms (e.g., technology, material culture, language, and other symbolic systems) may be important in allowing humans to supersede the biological limitations imposed by neocortex size (see Coward and Gamble 2008; de Ruiter et al. 2011). Symbolic behavior. Human capacities for symbolic behavior are tied to the formation and maintenance of social ties at all levels. The relationship between symbolic behavior and the formation and maintenance of social ties in the extended network is particularly important (Turner and Maryanski 1991:550). These ties, often created and maintained through kinship and exchange, can extend between groups and are significant in facilitating friendly inter-group relationships (see Chapais 2011; Hill et al. 2011). In general, resources used to maintain weak ties are likely to have a stronger symbolic component than those used to maintain strong ties (Gamble 1998:433). The distinctive aspects of human social networks (size, structure, and dependence on symbolism) are inter-related in a way that is unique among primates. In terms of personal network size, stable mean group sizes suggest that the social networks of nonhuman primates contain fewer than 70 other individuals (Dunbar 1992; 2003; Beauchamp and Cabana 1990; Hill and Dunbar 2003; Kudo and Dunbar 2001), far smaller than the networks of individual humans. While there is variability in the origin, strength, and maintenance of social bonds among nonhuman primates (Kasper and Voelkl 2009; Lehmann et al. 2010; Maryanski 1987, 1992, 1993, 1996), there have been no suggestions that the social networks of individual nonhuman primates have a strongly tiered, nested structure similar to that of humans. Finally, while many researchers would argue that some higher primates do have some capacity for symbolic behavior and communication (e.g., see Boesch 1991; Box 1984; Matsuzawa 1986), these capacities are in no way sufficient to support the level of symbolic behavior required for the cultural systems of kinship and exchange that are used to create and maintain the extended networks of humans. Social networks are difficult targets of study because of their size and complexity. This is true among extant social networks, and doubly true for networks that we must try to understand through archaeological analysis (see below). The first problem is size. The number of possible social connections within a given population rises disproportionately to arithmetic increases in population size (see Bossard 1945; Kephart 1950). In a group of 200, for example, each individual may have social connections with exactly 199 other individuals. The addition of one individual to the population increases the number of social connections each person may have by 1 (i.e., the total number of possible connections rises by 200). The total number of possible social connections within a group containing 200 individuals is 19,900, calculated using the formula N(N-1)/2, where N is group size (Kephart 1950). This number increases by (N-1) each time a single person is added. Doubling the population size to 400, for example, quadruples the possible number of connections (79,800). Quadrupling the population size to 800 increases the possible number of connections by a factor of 16 (319,600). 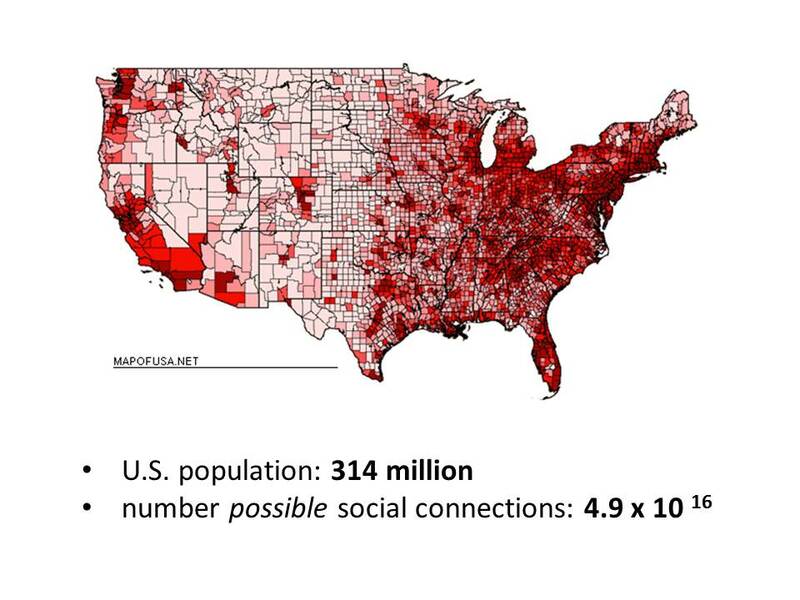 Over three million social connections are possible within a population of just 2,500 people. 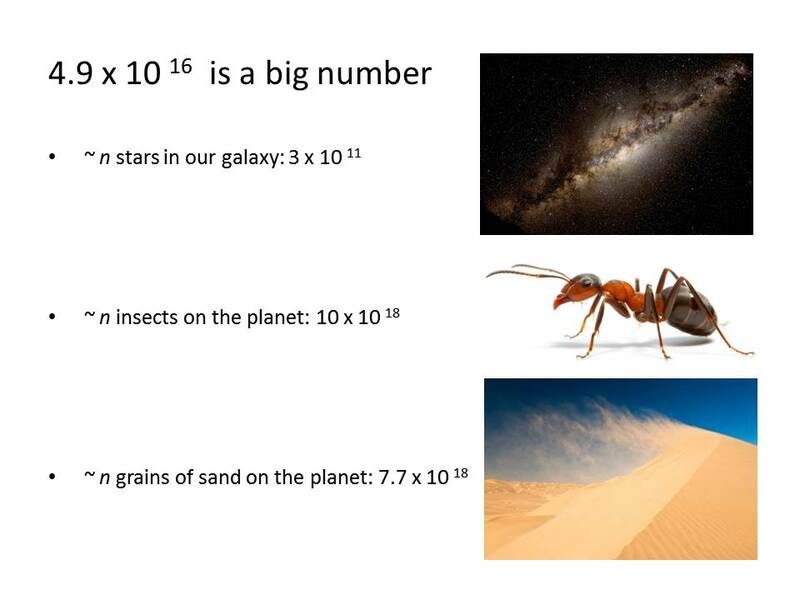 By my calculation, the number of possible social connections in a population of of 314 million (the United States) falls somewhere between the number of stars in our galaxy and the number of insects on the planet. Even within relatively small networked populations, the relatively large number and variety of social ties that individual humans form, maintain, and utilize create the potential for an immense amount of structural complexity. It is effectively impossible to recover “total” network data (i.e., data that include information on the entire egocentric network of every individual in a system) from just about any human system one could imagine. Therefore, real human networks must be carefully sampled in order to attempt to capture data relevant to understanding their system-level characteristics. It is a challenge to do that without ignoring or excluding the very interdependencies that network studies seek to analyze (Marsden 1990). Describing the structure of a social network (i.e., how the parts of the network are connected together) requires identification of the nodes in the network and the paths between those nodes (Marsden 1990; Turner and Maryanski 1991; Wasserman and Faust 1994). To the left is a visual representation of three small networks of nodes (representing individual persons) connected by links (representing ties between persons). Network size. The size of a network is simply the number of direct links between individual pairs of nodes (Marsden 1990; Turner and Maryanski 1991). Networks A and B in the figure to the left each have five direct links, while network C has 16. Network density. Network density is a measure expressing the proportion of links present relative to those possible (Marsden 1990; Turner and Maryanski 1991; Wasserman and Faust 1994). As discussed above, the number of possible links is calculated using the formula N(N-1)/2, where N is the population size. In a network with six nodes, there are 15 possible ties. In a network with 12 nodes, there are 66 possible ties. The density of networks A and B in the figure is 0.33 (5/15). The density of network C is 0.24 (16/66). Node degree. The degree of a node is the number of paths connecting to it (Hackathorn 2003; Wasserman and Faust 1994). In network A in the figure, nodes 1 and 5 have a degree of one and all other nodes have a degree of two. All the nodes in network B have a degree of one except for node 4, which has a degree of 5. Mean node degree is the average number of links per node. This could also be called “mean links per person.” It is a basic measure of the mean size of individual social networks. In both networks A and B, there are 10 one-way links among six nodes, resulting in a mean node degree of 1.67 in each network (10/6). Mean path length. By definition, any two nodes in a network can be connected by either a direct or indirect social path. The path length (or social distance) between any two nodes is the number of links in the shortest route between nodes (Hackathorn 2003). Nodes that are connected directly have a path length of one. In the figure, the path length between nodes 1 and 2 in network A is one. The path length between nodes 1 and 3 is two. Mean path length, the mean distance between every possible pair of nodes in a network, is a measure of the inter-connectedness or “closeness” of the entire network (Lovejoy and Loch 2003). An exact calculation of mean path length requires finding the shortest possible path between each pair of nodes. Thus the number of paths needed to calculate mean path length is equal to the number of possible connections in a network. For very small networks (such as those in the figure), this is not problematic. As the number of paths increases and the structure of connections becomes more complex, however, it becomes more and more difficult. The structure of a network (how the nodes are connected) affects mean path length. Networks A and B in the figure are the same size and the same density. The mean path length of network A (2.3) is greater, however, than that of network B (1.67) because of the structure of the network. The presence of a single, well-connected node (node 4) in network B shortens the mean path length by serving as a hub for inter-connecting all the other nodes. Network C has more nodes, more connections, a higher mean node degree, and a higher mean path length (2.53). Note that it would be possible to re-arrange the structure of the links in any of these networks to alter the mean path length. It would also be possible to find alternative arrangements of links that would yield the same mean path length but differences in other characteristics. Social networks are an important component of every ethnographically documented hunter-gatherer society (e.g., see Binford 2001; Kelly 1995; Lee and DeVore 1968; Lewis-Williams 1982; Schweizer 1997; Whallon 2006; Wiessner 1982; Williams 1981; Wobst 1974; Yengoyan 1968). As in all human systems, the social ties linking individuals to one another serve as conduits for flows of three kinds of resources: materials, symbols, and emotions (Turner and Maryanski 1991:550). Ties among individuals within local foraging groups, households, and families form the intimate support and security network required for navigating the logistics of everyday life and facilitating the transfer of information between generations. Ties that extend outside the local group are critical to demographic viability, allowing individuals to locate mating partners and groups to relocate during times of resource stress. group and personal mobility are important in allowing the face-to-face interactions necessary for directly establishing and maintaining social ties as well as exchanging “third party” information about social relationships. Hunter-gatherer behaviors relevant to social networks are discussed more in the Hunter-Gatherer section of this site. Given the size and structural complexity of human social networks, can we ever hope to understand this critical aspect of human societies based solely on material evidence? My answer to this question is "Yes, I think we can." My answer to the question "How are we doing so far? ", however, is "Not good." Social networks affect many aspects of hunter-gatherer social interaction that articulate with material culture, such as social learning, exchange, and the movements of groups and individuals across the landscape. These connections make understanding prehistoric social networks through material culture a plausible proposition. That was my argument going into my dissertation work, and I still feel that way. In my opinion, however, most of the studies that claim to be doing some kind of "social network analysis" using archaeological materials are missing the mark by a wide margin. I am very skeptical of the idea that there are simple, intuitively understandable relationships between the characteristics of social networks and the material residues left behind by behaviors that are mediated by those networks. It just isn't going to be that easy, and you make a mistake if you assume that it is. Just as we now repeat the refrain that "pots are not people," we will one day say something along the lines of "sites are not social relationships." Sure, material culture articulates with social networks. But we have both empirical and theoretical reasons for being very dubious of the assumption that the relationships between the two are simple. I think we have a lot of hard work ahead of us to build the theory necessary to really understand how the structure of social networks corresponds to patterns in material culture at scales that we can observe archaeologically.